Good Saturday everyone today we are going to review the newest book from a featured author. 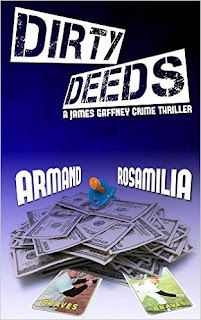 Today we are going to review DIRTY DEEDS by Armand Rosamilia . 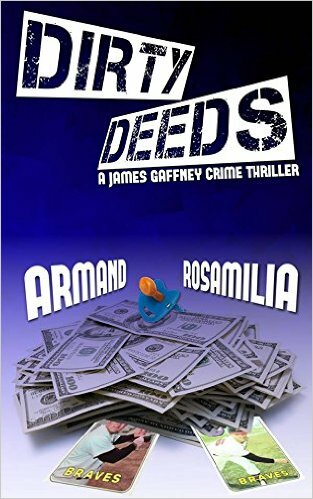 I found out about this book from a good friend, who wanted me to help get the word out via kindle scout program . When I read the write up I was so stoked , this was a book right up my alley. The story was a thriller and I knew I would gobble it up . The basis of the story is about a killer of children but he doesn't actually kills them. He saves them from parents that are a waste of skin and given new lives. Until the day one comes back to haunt him and how he races to find out the truth . I love how we don't know the true name of our main character , I was so intrigued by this man, he was strong but also flawed. He is a typical middle aged man with a secret life . He hides behind his baseball card selling and wants to live a life of quiet. We see him come alive as he is being stalked by the enemy. He goes balls to the wall to find out what happens . With the help of his personal assistant Marissa, who in my opinion reminds me of Garcia on criminal minds , the know all of the computer world . She is like a daughter to him and she is also his conscience. They are able to out wit and out play the FBI and the mob. Agent Reggie King is a character that I don't know about yet , he is a different duck , he has been hunting James for as long as he can remember . I didn't know if he was a good guy or a bad guy . Which I love in a character , they are the ones that make you think as you read . The rest of the characters consisted of goons and a mob godfather that are just making life very difficult for our poor main character . This was the first book I have read by this author and boy I was glad I did . He takes us on such a journey and you just can't put the book down . I was sitting on the edge of my seat most of the way through this book . I wanted to see if we found out the real identity of our James and then would he survive what was happening . The only thing that made me a little sad is the big cliff hanger that was at the end of the book . Other then that the author has done a masterful job of telling a tale of intrigue and mystery. You will be blown away by the writing style and storytelling . I so can't wait till I get the second installment in this series . This author is going to become one of my go to authors to read when I want a good thriller. So if you want a thriller that will keep you up and keep you reading all night long . Check him out .